I would have never realized this, except Wolf Pack member Dave just asked, "Will this make you Destro?" The answer is "uh, well, yes." I proposed marriage to the woman I love, Dina, who I've described as, "Y'know, she looks like the Baroness from G.I. Joe." This information means the following: I have proposed marriage to the Baroness. I am now Destro. 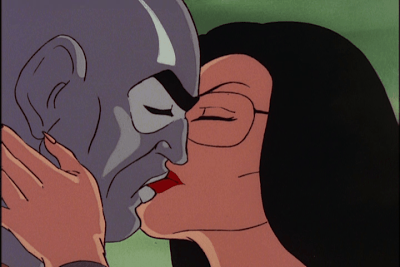 I did not know the complete Destro story, but based on intense Internet research, I have learned: "Destro's key characteristics are his sense of honor, a calm demeanor and love for Cobra's second-in-command, the Baroness." One major difference between me and Destro, though, is that he is forced to wear a steel mask for crimes, while I have a more conventional head made by 100 percent Polack DNA. This will be the second marriage for both me and the Baroness. I might argue that fact makes the marriage even more impressive. No myths. No fantasies. Just pure love, understanding and the ability to feel good daily and feel happy to see each other each day. I could say the details of the romantic proposal. I did it on my 42nd birthday! I did it at the Walt Disney Concert Hall. That Frank Gehry — he deconstructs architectural standards with massive projects of impact. I might say that I got her father's blessing in advance and got down on a knee. But, nah, let's have those details disappear. I just feel cool, knowing that I'm giddy over my girl, the Baroness, and she loves her Destro, AKA the Polack. Shoot, I must admit I don't "know" anything. This marriage proposal is guttural. I didn't consciously choose this, but I would if I could. I don't choose to love Dina, but I would if I could choose it. This love thing has chosen me, and I love it. I love her. Yeah, Hawkeye will be hitting on her at the bar. Clutch will be making some advances after he fixes her car. I'll, too, get my fair share of winks from Scarlett. That's life when you're a couple in love: Destro and the Baroness.